Growing old is a fact of life, but it doesn't have to mean that you have to look old feel tired or constantly exhausted. 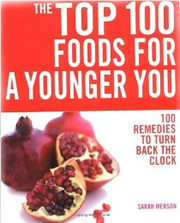 Wouldn't you like to discover the top 100 foods for younger you. Can really help you and below are a few teasers regarding what the book is about Discover remedies to help you look and feel wonderful and find out how the power of food can help you reduce lines and wrinkles. These 100 tried and tested remedies can help enhance your energy as well as protecting you against age related conditions. Find easy, inexpensive treatments in this book which can also work wonders. If you need further assistance please contact us for more advice and information.Or call us on 020 8421 5977 to find out more.